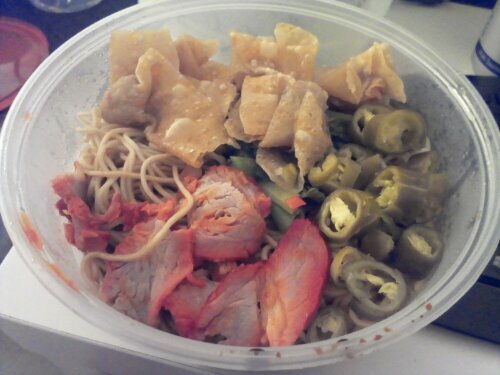 Wanton Mee | Get Your Grub On! I had checked out of my apartment and my friend picked me up to have a quick bite before I left for Singapore. On the way to Central Station we passed a little underground branch of a popular restaurant chain recommended in one of the past Michelin Guides – ‘Tsim Chai Kee’. 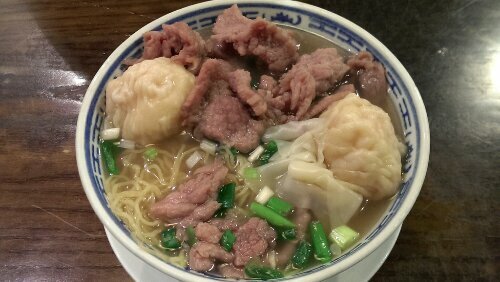 They didn’t have many dishes to chose from but since we needed something after a rough night we ordered their signature ‘Wanton Noodles‘ with sliced beef and prawn dumplings. They also had shredded fishballs as add on but since I genuinely dislike those I totally didn’t care. Not even five minutes after ordering our bowls already arrived and looked promising. I’m usually not a big fan of prawn dumplings but these ones were actually pretty decent. Fully stuffed with big chunks of prawn this was exactly what I needed. The beef on the other hand was as expected super tenderized and as wobbly meat grosses me out most of it stayed in the bowl. The noodles were lovely yellow and eggy with a firm bite to them and the broth was well seasoned and tasted like a strong concentrated chicken soup. Definitely not many points on the interior design scale but a cheap and decent noodle fix after a long night, no question.